Off cuts and leftover meat can be used to fill Asian spring rolls made with lots of freshly sliced lemongrass, lemon zest and hand-picked spearmint. This is a taste and texture explosion! 4) Put the spring roll pastry on a surface with a corner facing you. Place the flour paste along the edges of the opposite 2 sides. 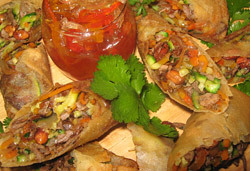 Place about 65g of mixture in the center of the spring roll pastry and roll up folding in the two side corners.